Built in 1850 for the property developer Charles Wilsone Brown, and later enlarged by architect Robert William Billings in extraordinary manner. Castle Wemyss played host to visitors including Haile Selassie and Anthony Trollope, but was abandoned after 1957. The shell was demolished in 1984 for a housing development. Image credit: The Castles and Mansions of Renfrewshire, Alexander Hastie Millar, 1888. Panmure was a large 17th century house later enlarged by David Bryce. It was blown up in stages by Charles Brand in 1955 after being stripped of saleable contents. Unusually, Brand recorded many of the houses his firm demolished in high quality photographs, and in some cases they are the best records we have. Image credit: Vintage postcard, collection of the author. Not all lost houses were demolished in the 20th century. 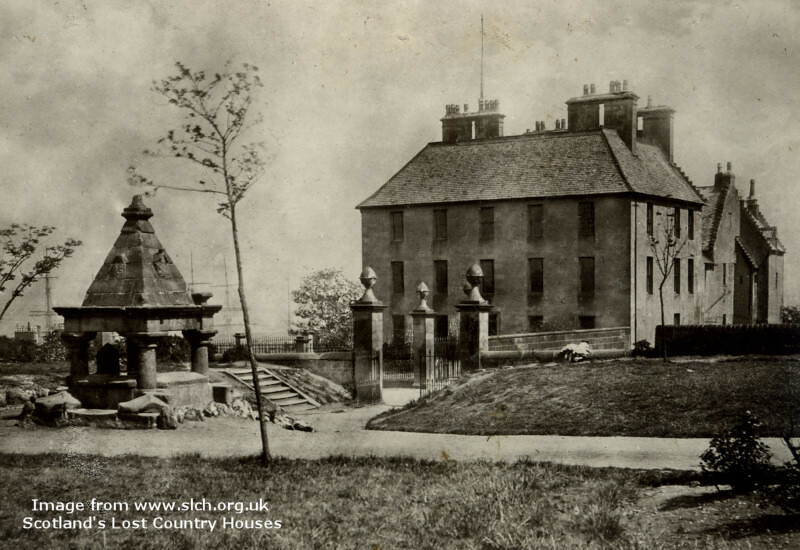 Greenock Mansion House, parts of which may have dated from the 16th century, was swept away to make room for a railway soon after this photograph was taken. Note the masts of moored boats on the nearby Clyde. This is not the famous lost David Bryce house, but the much earlier house with "thick walls and secret recesses" (Mackenzie) that was demolished to make way for its Victorian replacement. Many country houses, whether lost or surviving, replaced earlier buildings of which very little record was kept. Image credit: Unknown painting, reproduced in Kilbarchan - A Parish History, Robert D. Mackenzie, 1902. Scotland's country houses vary from elegant neo-classical mansions to the high Victorian drama of Scots Baronial. Over 500 have been lost over the past 150 years, and this website aims to document them. You can browse the list of houses via the alphabetical lists (top of page) or the Google site search box (top right). The Resources page lists resources useful to the study of lost Scottish houses. The site has had a slight rearrangement, with a new complete list of all known lost Scottish country houses, and many significant villas. I hope this will be of use. Visit the Scotland's Lost Country Houses Facebook page to know about updates here, join in conversation, or send us encouragement. This website is researched and maintained by Dr Alastair Disley. After a childhood exploring the remains of a lost country house estate, research began again in 2002, and this website was first published in 2006. 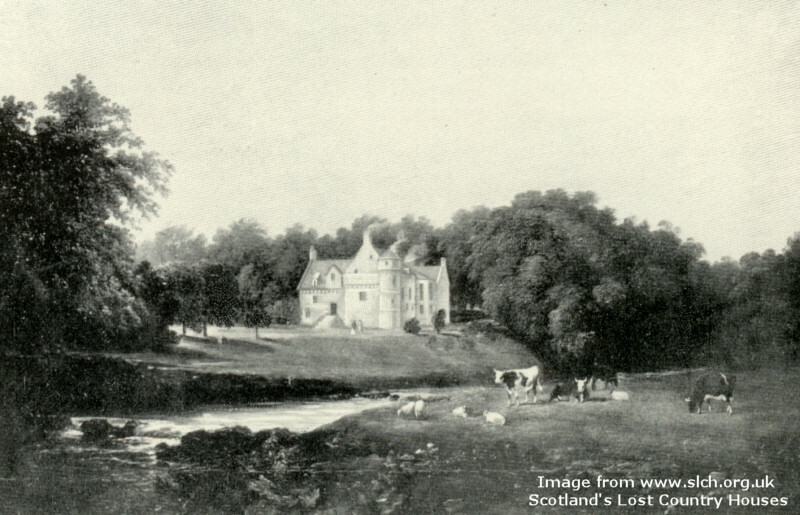 Scotland's Lost Country Houses is independent, non-commercial, and receives no financial support from any public body. You are welcome to contact the author by email at aldisley@yahoo.com. Hundreds of country houses were lost during the 20th century. Some were victims of fire or subsidence, but many were deliberately demolished due to impracticality, changing tastes or property development. To understand why, we need to go back to the eighteenth century. Scotland's economy expanded greatly after 1745, with a huge growth in large country houses built during the late 18th and 19th centuries. Some were built with profits from their estate, others with money from new industries or international trade. These larger houses were home to entire communities, dedicated to impressing their guests. Often the family occupied a separate wing, able to minimise their contact with both guests and servants thanks to clever design and multiple staircases. Even humble shooting lodges, never designed for permanent occupation, were grandly rebuilt with some rivalling leading country houses in their size and complexity. 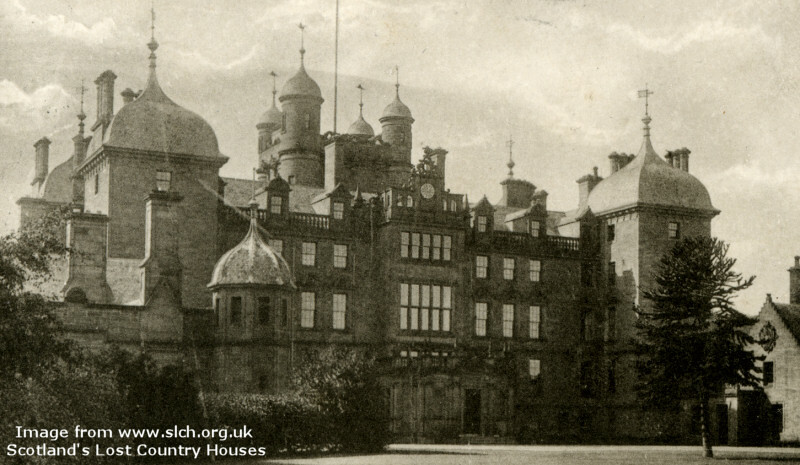 During the 20th century, changes in society had a detrimental effect on Scotland's country houses. The large incomes necessary to maintain a country house dwindled, a process exacerbated by increases in general and inheritance taxation. The agricultural depression had less effect than in England, but many house owners no longer had a good reason to maintain them. Then the Second World War broke out. Country houses were commandeered to serve as barracks, hospitals, headquarters, prisoner of war camps and homes for schools relocated from towns and cities. Many houses had more use than ever before. But when owners returned, their properties were usually in need of repair, with basic maintenance having been ignored. In five years, a blocked gutter can become a serious case of dry rot. Compensation was paid, but often too little, too late. Most country houses struggled on for a time, but the war years sealed the fate of hundreds. There often seemed little point in maintaining a large house that was socially and architecturally out of kilter with post-war society. Large houses often lacked amenities such as electricity and adequate plumbing - Panmure, for example, had just two bathrooms among its 130 rooms. And so many houses lost their roofs to save on taxes, or were completely demolished, often after significant effort on the part of their owners to find alternative uses. Houses were sometimes worth more as raw materials than as houses, particularly during and after WWII. Kimmerghame is an interesting example. In 1938 it was being updated to add electricity, when a workman's error resulted in the main part of the house burning down. Nearby Stichill House was being stripped of its fittings prior to demolition, and timber from there was used to help repair part of Kimmerghame. With the advent of WWII, the remaining unrepaired shell was demolished, and the stone used to build Charterhall Airfield, along with some of the rubble from Stichill. Kimmerghame therefore both provided and benefited from ex-country house raw materials. This economical re-use of materials continued after WWII. 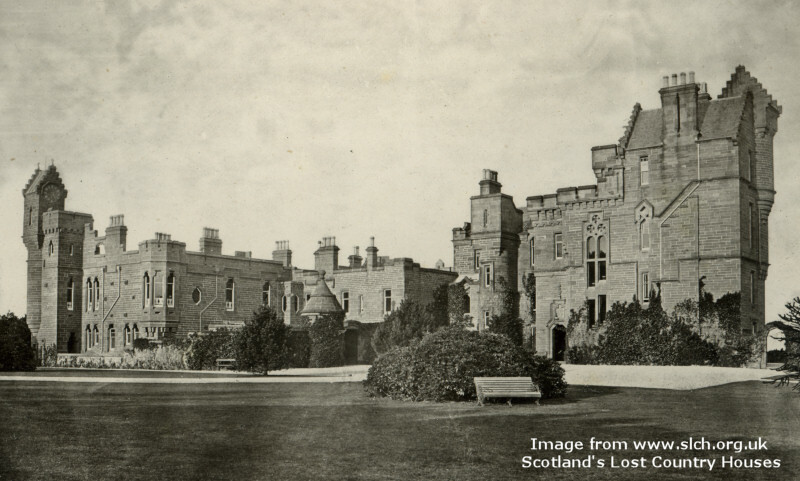 For example, Murthly Castle (never actually lived in) was demolished in 1949 to provide a vast quantity of stone for Pitlochry's hydroelectric dam. In some cases, the re-use of historic buildings as hospitals, colleges and institutions was only a postponement of redundancy. Due to closure or new health and safety regulations, many of these buildings have again fallen out of use. Another factor has been the encroachment of development, from wholesale replacement of a country house and its grounds with a housing estate to the more recent fashion of enabling development, in which a house is restored as a multi-occupancy dwelling at the price of being surrounded by modern housing (e.g. Auchenbothie or Ballochmyle). The factors leading to the demise of so many country houses are unfortunately no connoisseurs of architectural quality, and the listing system sometimes offers little more than a drawn-out stay of execution while options are considered. Listing means that the loss of country houses is now just a few each year, and those that are demolished have usually had their plight visible for some time. It is almost certain that some of the country houses featured on the Buildings at Risk register will eventually join this directory. However there are may people and organisations seeking to find new uses for threatened buildings. No country house's loss remains inevitable.